This is Part II of my review of the Sony PEG-T415. When I wrote Part I, I'd only had the T415 for a few days and I was hesitant to draw too many conclusions from my limited exposure. Now that I've had it for much longer, I stand by my original conclusions. If you haven't read the first part yet, you should go and do so now. I still think the T415's screen is too dark. Lighting conditions that I can use other handhelds in just fine require me to turn the T415's backlight on. And considering that it has a blue-green backlight, it isn't something you'll want on all the time. Maybe if Sony had put a white backlight on it and I could just leave it on all the time I'd be happier, even with the extra battery drain. I hope by this time the myth of the T415's "paper white" screen has been laid to rest. It only existed in people's hopes. I'm not a professional photographer and my digital camera is fairly lame but I snapped a comparison shot with the T415 and a Visor Pro. It's far from the best photo I've ever taken but it does show the difference in the screen contrast and size on the two models. I'm not saying that the screen is unreadable. It's just a bit dark. In bright light it looks great. The high-resolution part is good. If you want more screen real estate than a 160 by 160 screen can give you and you don't care about color, the T415 might be a nice option for you. It comes with some applications that take advantage of the hi-res screen, too. 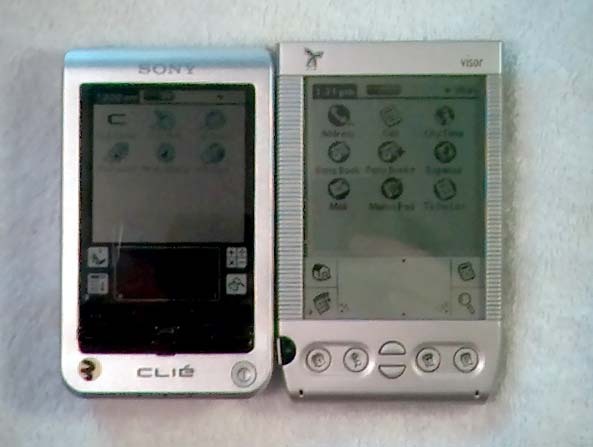 In addition to Picture Gear Pocket, PhotoStand, and gMovie, which have appeared on previous Sony handhelds, the T415 comes with Clié Paint, a small image editing app. I don't think graphic artists will stop using PhotoShop in favor of Clié Paint but it is still pretty good. You can create images from 320 by 320 down to 160 by 120. Once created, you have various drawing tools you are probably familiar with from other drawing apps, like a pencil, an eraser, a spray can, and tools for drawing geometric shapes. You can also import small bits of clip-art. You can open drawings you created in Clié Paint in PG Pocket and even edit any image that is in PG Pocket format. Like I said, Clié Paint isn't a full-featured image editing program but it has two big advantages: it runs on a handheld so it can go with you everywhere and, best of all, it's free. Before someone asks, it runs only on 320 by 320 handhelds. I tried installing it on a 160 by 160 one and it refused to run. However, if you have an N series model, you can download it from nXt's Clie Club. If any of you want to email me an example of a picture you created with Clié Paint that you are especially proud of, I'd be happy to attach it to this review. Mine all looked like they have been created by a 3-year-old. One of the handiest functions of the T415 is its greatly strengthened infrared port. Sony included it so you could use your handheld as a universal remote. I think this is a darn useful function. 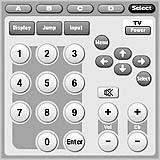 I almost always have my handheld on me so it saves me the hassle of hunting up the remote when I want to change the channel. Programming it is quite easy. You just need to specify type of device (TV, VCR, etc.) and the manufacturer and you are good to go. This works pretty well. I've been able to control everything I've tried to, with the irritating exception of my VCR. Still, it's worked fine with lots of other TVs and stuff I've tried. 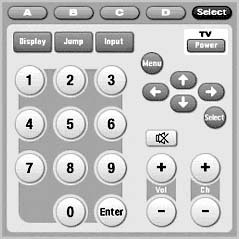 You can also set it to do things with the Jog Dial and hardware buttons, like change channels. This makes channel surfing a breeze. It's got a good range; at least as good as my regular remote. Another nice improvement in the T415 is the speaker. It makes you realize how lame the speakers on most Palm OS handhelds are. It is both louder and capable of much richer sound. The T415 comes with an app called, uncreatively enough, Sound Utility 1.0. Together with a conduit on the PC, it lets you import and play files in WAV and MIDI format. These sound pretty good. Well, to be honest, I'm not fond of MIDI music but the WAV files sound good enough that you can understand a voice. This is Singing Bird a sound that comes with the T415. I played it on the handheld and recorded it with my computer, so this is mighty close to what it sounds like in real life. Another application that takes advantage of the improved speaker is the World Alarm Clock. It lets you set up to five different alarms and, unlike the built-in Date Book, assign a different sound to each one. This is a feature I've wanted for a long time. You can control almost anything about each individual alarm. For example, one alarm can play a tune for 30 seconds and use the vibrating alarm while another can play a different sound for five seconds, not vibrate, but blink the LED. Alarms can be set to go off once or repeat by day of the week. When the alarm goes off, it displays a screen that looks like the one from the built-in Date Book, with an OK button and a snooze one, too. 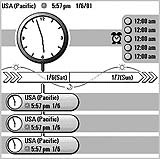 The World Alarm Clock lives up to the other part of its name by displaying the time in three different places or time zones. It isn't meant to be a complete Date Book replacement. It can only keep track of five alarms at any given time. While I'm on the subject, the T415 does have something for the built-in Date Book. Once a sound has been imported with the Sound Utility, the Date Book can use it, too. I wanted to mention in passing that the T415 comes with a demo version of Zap!2000 that has been enhanced for the T415's speaker and it sounds just awesome. I hope more games will be created with better sounds and that more handhelds appear with better speakers. Sony has taken a page from Palm's book and bundled DataViz's Documents to Go Standard Edition with the T415. This means that you can transfer Word and Excel files onto the handheld, edit them there, and then transfer them back. I'm not terribly fond of Docs to Go's user interface but it does a great job of transferring the files between handheld and PC without messing up the formatting. In fact, it does a better job that Microsoft's own Word and Excel editor for the Pocket PC. OK, enough about software. There's a lot that's good about the T415 but the flip cover that comes with it is definitely not a high point. The T415 has very professional styling while the flip cover looks like an ugly after-thought. It clips onto the back and stretches across the top and then down the front. This blocks access to the Memory Stick slot, which really doesn't need the extra protection as it has its own door to keep out lint and such. Sadly, it doesn't cover the stylus slot, which does need the protection. I've been worried since I got the T415 that I would lose the stylus as turning the handheld upside down and shaking it will cause the stylus to fall out. The T415 has a rechargeable battery that is capable of keeping it going for quite a while. The monochrome screen and weak backlight don't put a lot of drain on it. In fact, I think they'd have been fine with AAAs but the T415 is just too darn thin for that. Sony estimates that you should get 15 days of use out of it, though that is entirely dependent on how much you use it. If you like to use your handheld one handed all the time, the T415 has some great features to help. Say you are in the Address Book. Hold down the Back button for a second. The Category drop-down box will be highlighted and you can use the Jog Dial to scroll through it. Hold it down longer and the first Menu will drop down so you can scroll through it. You can even add additional functions to the menu, like Power Off or Find. Sorry, I can't answer whether Sony has fixed the USB problem in its version of OS 4.1 that prevents Mac users from HotSyncing because I don't have a USB Mac. I can say that I was able to do so with my PowerBook via infrared. The Clié-Mac Page, which I depend on for help in this area, hasn't been updated to include the T415. The look and shape of the T415 are good but the screen and buttons are a definite minus in my book. This is the first Sony handheld in a long time that I can't give an unqualified recommendation for. I wouldn't suggest you buy one without testing it out at a store first. I am surprised that Sony didn't include a Phone Dialer app that would produce the Touch Tones to dial a phone number for you. This new speaker should support that, right? If you ever used a Newton you know what I'm talking about. That is one thing that I really miss from my old Newton. I suggested this to my Sony rep after I first heard about the T415. I agree, it would be great. If they don't do it, maybe some third-party developer will take the idea and run with it. Yep... the Newton was so far ahead of its time. Hopefully someone will whip up a DTMF dialer, as I'm pretty sure the 415's speaker is capable of it. There are several DTMF dialers for the TRGPRO's enhanced speaker system. I wonder if they will work on the T415. I think this would be pretty easy to do since you can play WAV files, probably even easier in MIDI since DTMF is Dual-Tone-Multi-Frequency and the MIDI engine (a Yamaha device) can place 16 simutaneous tones. I'm even more surprised that they didn't include a microphone for recording voice memos. I mean, who practical use is copying .wav files over toyour PDA? Don't know anyone that has a healthy .wav collection anymore, MP3's took over that slot in a big way. Voice memos are a major plus for the business user. "I'm even more surprised that they didn't include a microphone for recording voice memos." My guess: it wouldn't fit. Not the microphone, the digital signal processing chip needed to record sound. The only model that can record sound is the HandEra 330 and its roomy casing lets you put in plenty of hardware. Recording sound is much harder than playing sound. Even the N series can't record sound. ED, think I found a typo. This is Singing Bird a sound that comes with the T425. I played it on the handheld and recorded it with my computer, so this is mighty close to what it sounds like in real life. Shouldn't that say T415? can it control a tivo? a dts receiver? is there a list somewhere of what it can control? So I guess no one is using the remote capability? It appears w/ the initial release of the app. that you can only use it for TV, VCR's, DVD, and "A/V" Amplifiers. As has been said in the CLIE Users Group, http://groups.yahoo.com/group/CLIE_Users_Group/ it is not a good idea to rip copyrighted programs from a device and them post them for download. I believe nXt had a difference of opinion with the moderators of the CLIE Users group regarding the acceptability of this kind of warez and he left in a huff and started his own group. I'm surprised you support the illegal posting of copyrighted programs. Before nXt posted those files, he asked me to speak with my contact at Sony about how his company felt about distributing this app. He said it was fine, especially as it will only run on Sony models. This doesn't mean that anything Sony makes is fair game. This same Sony rep was very unhappy about the unauthorized OS 4.1 upgrade. But he specifically said he was OK with sharing Clié Paint. I am wondering how many time you have to post that yor Sony contact said is OK for Clie files to be shared with the exception of 4.1 for SOME PEOPLE TO START READING IT. This must be at least the 3rd time I have heard it. Thank you, again, for the update to the update! Yeah... Clie paint will run on the color models, but the program only supports 16 shades of gray. Not if you have the color version of Clie Paint. "I believe nXt had a difference of opinion with the moderators of the CLIE Users group regarding the acceptability of this kind of warez and he left in a huff and started his own group." Just for the record, this wasn't the reason nXt left at all. nXt had contributed greatly to the old group by being a moderator, helping answer many questions, and finding and uploading apps that were very useful to the Clie community. How was he thanked for all of this effort? By having his uploading privileges revoked by another moderator. His crime was cleaning up some of the zip files to remove needless files that were eating away at the precious 20MB of space that are allotted to groups and not putting the word "shareware" in the description of all apps when it was obvious that they were shareware. This same moderator had been censoring many posts for several months that had the gall to mention something, anything, that he did not agree with, and he would often ban the people who made these posts without warning. One gentleman who was a contributing member of the group was banned because he posted a link to a new "Doctor Palm" group that he was starting; apparently this was seen as some kind of competition to the CUG. When nXt's permissions were revoked, he justifiably said that he would no longer be spending his time helping a group that didn't appreciate his efforts, and would instead be moving on to other existing groups. Several members of the CUG asked him to start his own group and promised him that they would follow him there if he did. It was only after this that nXt started his group, and it has been very successful in the just over 2 weeks it's been running, with nearly 1000 members and over 2300 posts. Ed, you might want to double-check this. I also have contacts at Sony and have asked them about this. They are quite concerned that their files are being distributed like this and were also upset by the illegal upgrade that has been developed by warez pirates. The people I spoke to indicated that NO Sony programs should be hosted outside the Sony site without permission. While they probably wouldn't use legal means to stop this (unlike Palm), I wonder if it is fair to support this kind of activity. heh, I must say, this is an interesting twist on the ask Mom, ask Dad thing from our childhood. When we were kids, and Mom said we couldn't do something, we'd run and ask Dad, and if he said that it was ok, we were happy as a clam. Now, we ask one Sony Rep whether it's okay to do something, and he says that it's fine. So we run to another Sony Rep and ask again, just so that he can say no? Haha, I gotta say, I just don't get it. Was your conscience bothering you so much that you just had to go and ask again? Cause I'm sure you ask long enough at any company about anything to their CS reps, eventually you're bound to get a negative answer. It's just gonna be a shame for all the PIC and nXt Clie Club users that these files are no longer going to be available for, with no one winning in the end. This sounds sucpicously like the guy who threatened to sue PIC before. Forget him, he's a liar. Why post Sony software anyway? Arbitrary company representatives or contacts generally do not have authority to permit redistribution of software. I think relying on such statements is asking for trouble. And what's the point? If Sony wanted to distribute this software, they would do so from their web site. And if it was freely redistributable, it should so in an accompanying LICENSE file. Ed, why does this Sony representative always go nameless? It's not like this is leaked, hush-hush information; if he really represents Sony about these issues, he should be willing to disclose his name and be accountable for what he says. Referring to an anonymous "Sony representative" is meaningless; Sony is a very large, global company, and there are clueless people who think that a Sony representative from the Playstation division knows much more about CLIE projects than a guy off the street. Trust me, I'm not getting this info from the guy who sweeps up at Sony's corporate HQ. He's part of Sony's U.S. marketing team. As for what his name is, that's an interesting question from someone who posts anonymously himself. I am pretty sure I know who your Sony contact is, Ed, but things like this still ought to be "on the record". Does anyone know, from a technical standpoint, why the T400/415 screen is so dark in comparison to the T600 screen? Is this a matter of different backlights or the screens themselves? RE: T400/415 vs. T600 screen? The color screens actually have a small mirror behind each pixel, while the black and white screen just has a highly reflective whitish background, since a mirror couldn't let the backlight pass through. Another note on the screen here. I think i've figured out why they made the screen default to black in its off state. I've noticed that the screen has a poor refresh rate, and that fast moving objects appear very light (or not at all) and all dark objects fade into view instead of appearing. My guess is that originally, the opposite was true, and everything that moved was leaving darks smudges, so they flipped the polarization of the screen and modified the lcd driver to produce a negative image. They also lowered the refresh of the screen, so everything appears to be flickering slightly. The T600 is color, so the frontlight is on by default, while the T400 is monochrome and has the backlight off. I have been able to sync my T415 with my Mac 9600/350 with USB card no problem. I am using the Missing Sync software from MarkSpace. This unit was traded in to replace a Visor Platinum that was giving me problems. I agree the screen is darker. I feel this is definately outweighed by the size of the T415. I am derfinatly getting more use out of this unit than my Platnum. I love the jog wheel. My co-workers have the m505 and love the form factor and build of the T415. When this come out in color it will be the Palm OS unit to beat. I'm running Mac OS X and it syncs just fine with Palm's 4.0 beta for X. No third party needed. > how does the 415 compare to the 330 in sound? Sorry, I can't help you. While I have done reviews of both models, the HandEra 330 one was about six months ago and my memory just isn't that good. The best advice I can give you is to find a CompUSA which has both in stock and compare their speakers side by side. I can't comment on how the volume compares between the t415 and Handera 330, but the capabilities are quite a bit different. The Handera 330 has basically just cleaned up and amplified the PWM signal from the Motorola chip... this makes it a bit louder and a cleaner tone quality than the other 'piezo electric speaker" Palms. The t415 on the other hand has a built in FM synth sound chip (made by Yamaha) that supports ADPCM file playback (a compressed digital audio format) and 16 note polyphonic General MIDI. This is the same technology that is used in the Beat Plus Springboard module. Software must be designed to take advantage of the enhanced sound capabilities (like the bundled Zap2000 or miniMusic's NotePad). I saw the T415 at a local computer store and I found the screen definitely too dark. I would like to have the higher resolution and the jog dial, but I think an M500 is overall still a better choice: pretty much the same size and brighter screen. I agree. What good is higher resolution if you can't see it? The slow refresh rate also bothers me. Things fade in-and-out of view. On the 33mhz processor, I think that's shameful. I get faster transitions from screen-to-screen on my old IIIxe, using just a 16mhz processor. Compelling features, but overall I have to give the T415 "Thumbs Down." Let's see how the T615 is. Under no circumstances, regardless of how cool the Sony PDAs are, should you buy a Sony product! After owning 3 Palms (5000, IIIxe, and Vx) I switched to the Clie. I love the jog wheel, screen, all of it. BUT, when I sent it in for service I was slapped back to the reality that something has to be sub-standard. That sub-standard (aka TERRIBLE) aspect of Sony is the Customer Service. Or, lack of. Imagine sending your Clie in for repair only to have Sony say, "uh, it never arrived." But, UPS shows it did arrive and was signed for... does this sound plausible. No, wait, it gets worse. Sony will not return phone calls, and they act as if it's no big deal. I'm out a PDA, the $400 I spent on it, and alot of freaking time trying to deal with them. Do yourself a favor BUY A PALM, HANDSPRING or HANDERA, but under no circumstances buy a Sony. PS: If you work for Sony, please email me and we can talk, 'cause I'm not a happy customer as you can tell. Ah, yes, there's the rub. Just remember: if somethings sounds/looks too good to be true, it probably is. Woe unto Sony if they ever have a QC problem - don't assume it can't happen, because it just might. Perhaps if buying a Sony it would be a good idea to purchase one of those "protection plans" that the CompUSA's, BestBuy's and others are always trying to push off on you. I always just tell them to save their breath on telling me about it because I have never had a problem with Palm's replacement proceedure, but after everything I have heard about Sony's customer service when I get the T615 (Or whatever it will be called) I will probably opt for some sort of plan. Let the reseller haggle with Sony as you walk out of the store with a new Clie.